While Windows remains the dominant platform for PC gaming, Microsoft’s stranglehold is slowly eroding. True, Linux and macOS won’t overtake Windows 10 on the desktop anytime soon, but as developers are learning, you can make money by supporting alternative operating systems. With Linux in particular, users are very loyal -- many won’t dual boot with Windows for gaming. The only way to get their dollars is to embrace the penguin. 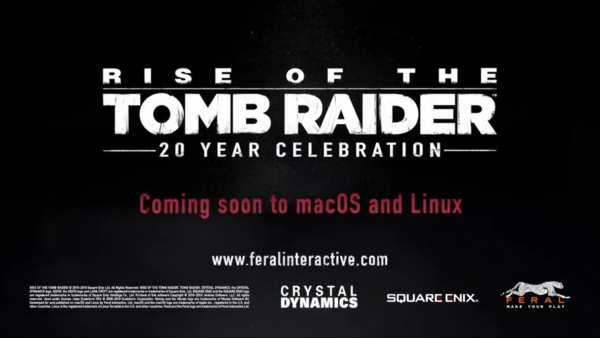 Developer Feral Interactive has seemingly gotten the message, as it is bringing one of its top-tier titles to both Linux and macOS. The game to which I’m referring is Rise of the Tomb Raider, featuring the iconic cave-explorer Lara Croft. Speaking of the game, the developer says, "In Rise of the Tomb Raider, play as Lara Croft and explore the most ancient and remote regions of the world to uncover the secret of immortality. Master Lara’s combat, hunting and survival skills in beautiful but lethal environments while staying one step ahead of Trinity, a secret global organization." Unfortunately, we don’t have many other details about the Linux and macOS release -- including price. The company says it is coming in "Spring" but that is a bit vague. Quite frankly, when it comes to video games, release dates have a tendency to slip too. Hopefully since this is just a port, it should definitely be available in Spring as promised. What we do know for sure, however, is that it will be the "20 Year Celebration" edition. What does that mean? Well, it will come with a ton of DLC for free. In other words, this is the best variant of the game. Are you excited to play this game on your Mac or Linux box? Tell me in the comments below.